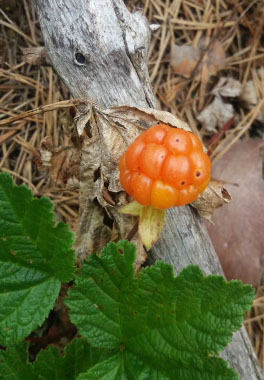 Cloudberries are in the rose family and are a low perennial forb. They are typically known as bakeapples in Newfoundland and Labrador. 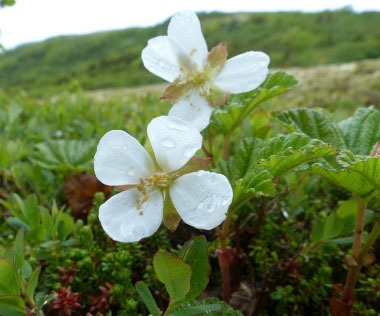 This berry grows almost exclusively in circumpolar regions and is prized in cultures and cuisines in Scandinavia, Russia, Canada and throughout Alaska. 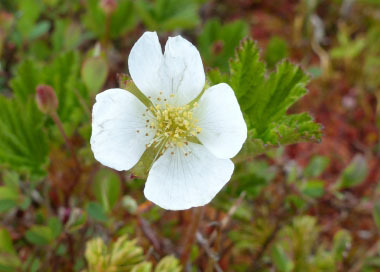 Cloudberry’s berry production varies a lot over the years. Frost during the flowering time can ruin the whole crop and cool weather immobilizes pollinators. Heavy rains and storms can rip the delicate petals in a way that pollinators cannot find the flowers. Bad weather during the growing season shows up the next summer too in the shape of a poor inflorescence. Distinguishing Features: This plant spreads by creeping rhizomes and they grow close to the ground. 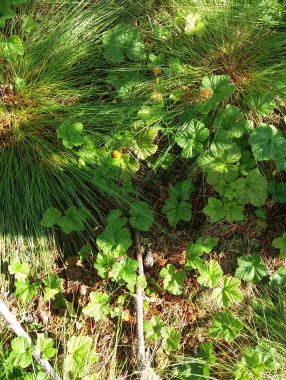 The cloudberry plant produces only a single berry on each stem. The fruit is an aggregate with only a few drupelets. They ripen from yellow-pink and reach 2 cm across. Fruit is borne singly on a mostly upright stem. The fruit turns from red to an attractive yellow-amber colour when ripe. Flowers: The flowers are unisexual, solitary, terminal, 2 to 3 cm wide, with male and female flowers borne on separate plants. The calyx is deeply divided into 5 to 8 oblong-ovate lobes, with short, abruptly pointed tips. The calyx is persistent in the fruit; there are 5 to 8 petals, white, obovate; male flowers with numerous stamens; female flowers with several, distinct pistils. Flowers bloom in mid-summer. 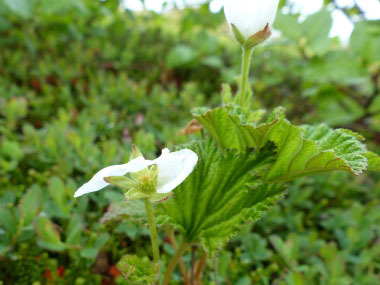 Fields of Nutrition has medicinal benefits and vitamin/mineral content of Cloudberry. Leaves: There are 1 to 3 leaves per plant, alternate, simple, palmately-veined, stalked (petiolate), deciduous. Leaves are kidney-shaped to round, measuring 4 to 11 cm wide, with 5 to 7 broadly ovate to rounded lobes; leaf base cordate. Leaf margins are toothed, crinkled and often also wrinkled. The underside is hairy with yellow glands. The leaf petioles are somewhat hairy. 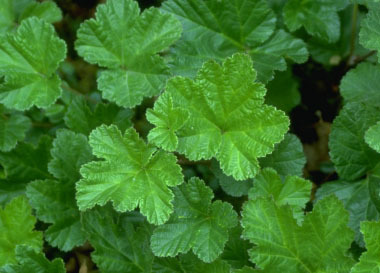 Height: This plant grows 10 to 25 cm (4 to 8”). 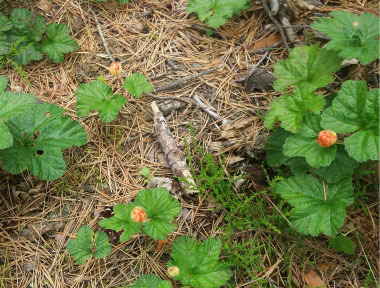 Habitat: Cloudberries are found in bogs, wet peaty meadows, and in tundra regions. It is native to the northern boreal and arctic regions of North America and Eurasia. They also like swamps, mossy open bogs, slightly elevated dryer ridges on string bogs, peaty moors and rocky outcrops. 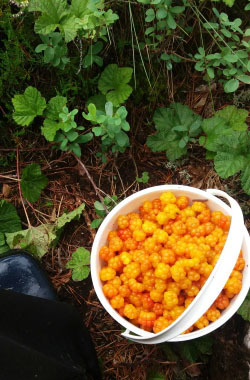 Thank-you to Päivi Lehtonen, my Instagram friend in Finland for providing the images of ripe cloudberries. Her website is: www.perinnepata.fi and you can follow her on Instagram: @Perinnepata.